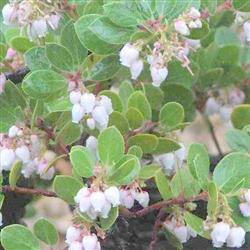 Carmel Sur manzanita is a low growing evergreen shrub, with light green leaves. Plant in part shade inland to full sun (with a little extra water) near coast. Carmel Sur likes good drainage but will also survive clay. It is very garden and water tolerant as long as the water doesn't stand on it. Carmel Sur grows fairly rapidly for a manzanita and the new growth is bronze. This arctostaphylos is greatly appreciated as a fast way to cover large slopes where it will stabilize soil and quickly smother the weeds.